Whether you're looking for more looks, more comfort and more efficient, choosing replacement clip-ons is not the easiest thing to do as there are a number of details that come into account. At ABM, they have chosen the side of versatility with their new Multiclip. 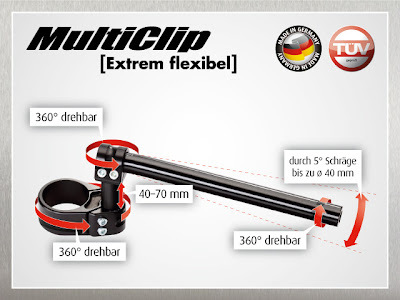 The Multiclip is equipped with adjustable rotation of the tube, at the elbows and clamps, plus the possibility of two lengths of stems (0-40mm version and Sport 40-70mm version of the Tour). To complement the capabilities of the product, ABM has produced an elbow tube holder with 5 ° tilt, thus compensating the inclination of some water reservoirs. The complete kit can accommodate a large number of motorcycles will be available for € 319. Chaft, a French manufacturer and distributer of motorcycle accessories, has just added a new product to their offerings, simple, not terribly innovative, but effective for passenger safety. To avoid having your " sandbag " of a passenger do a back flip at the slightest acceleration Veector has created a safety belt. 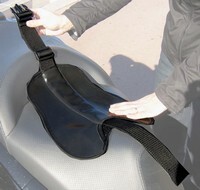 Composed of two parts, the Veector Pan Belt wraps around the waist of the passenger at one end, while the other end is placed under the rump of the driver. Easy to install, this concept seems like a decent idea and should certainly keep sleepy companions from falling of the back. Plus, it's a product that does not take much space for storage. 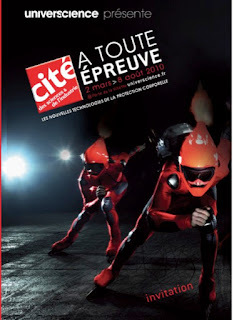 The new technologies of protection for man is the theme of the exhibition A toute épreuve, to be held from March 2 to August 8 at the Cité des Sciences et de l'Industrie in Paris. Dainese protection, the favored Italian tailor of Valentino Rossi is at the heart of this exhibition at La Villette which includes everything from a shell of an armadillo to Renaissance armor, the latest hi-tech equipment out Daineses' workshops (including D-air), a collection of his famous leather and also a short film on equipment Vale, simply entitled "The hero of the knighthood. So, one more stop to make if you are planning a trip to Paris and have a thing for museums and the finest moto gear around. 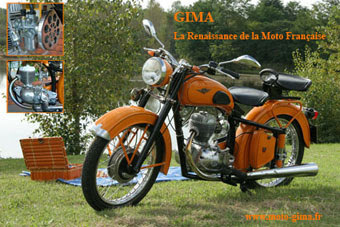 French Banks Not Willing to Help Moto GIMA! To accomplish this, GIMA needs money. They've applied to banks for a €400,000 loan to put their distribution network in place, but got turned down! Banks just aren't interested in providing money at this moment. They want to keep the money for themselves so they can distribute bonuses to themselves. Since the motorcycle manufacturer is small, the national French media aren't interested in picking up the story, and neither are the politicians. So Hilario Gonzalvez, the CEO of the company, has gone on a hunger strike. The only thing being proposed by (local) politicians is that they relocate the factory to Tunisia, which is exactly what the CEO does not want. He wants to make a French product, in France, with French workers. Kudos to him! It's pathetic when you realize that they have firm orders for their bikes, and lots of promise to develop their company for the future. French politicians should start looking at helping smaller companies survive instead of hammering down on bikers. In beginning of January this year, the marque Peugeot Motorcycles (yes indeed, they were once one of the greater producers of motorcycle in France)has given way to Peugeot Scooters, thus confirming the interest of the French firm to invest a little more in the segment of urban mobility. This also explains the establishment of two new position: Director of Sales Europe and the Director of Spare Parts and Accessories. With the objective to strengthen and improve the performance of the company mainly in the catagory +50cm3, the Directer of Sales, Bruno Muller, will be focusing on the the four major markets (France, Italy, Spain, Germany). 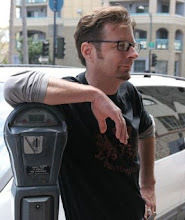 In parallel, and for strategic reasons, Jean-Marc Booty becomes the new Directorof Spare Parts and Accessories. This position should help improve the supply of products and services for new vehicles. That's right, the newest tech to arrive in France is a traffic camera that will flash you when you try and beat the yellow. And the penalty for giving the go, as we've all been doing since the arrival of traffic lights, well not nearly as bad a getting caught for running a light in the 'traditional' sense: 4 points knocked off your license and a fine of 135 €. In any case, it's not just running the big red that'll get you nailed now. The yellow light is in fact a stoplight just like the red, as noted under Section R412-31of the traffic code. It requires any vehicle arrive at a yellow light to stop. Braking specialist for the automobile, motorcycle, quad and even aviation fields, French manufacturer Beringer has set about improving the braking systems on two-wheeled classics. 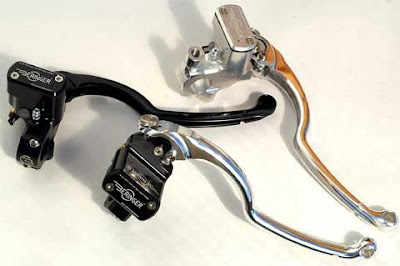 One of main weakness in the dynamic behavior of the classic motorcycles, the braking of a vintage ride can substantially improved by installing a Aerotec radial master-cylinder radial by this French firm. 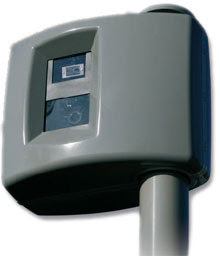 Mounted on three ball bearings to reduce friction and improve feel, these master cylinders increase "the stopping power by 40% " according to Beringer. Offered in black, polished aluminum or chrome, these modern and efficient pieces play the card of moderation so as not to distort the look of a vintage bike. An optional support for mirrors and the inclusion of a brake light allow you to customize the units to your needs. Available in two lengths of levers with integrated or separate fluid reservoir, these radial master cylinders don't come cheap at € 415, but since when is braking an area you should skimp on. For more information and contact points of sales, check out the official site of Beringer. 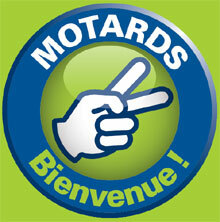 Things just got a whole lot brighter motorcyclist traveling though Doubs (25) in eastern France. The Tourist Board (CDT) of Doubs has set an example for other regions to learn from by launching a new label "Logis moto" in partnership with the hotel chain Logis and FFMC 25 of Doubs. The department strengthens its welcome of two wheeled clinets after the establishment in 2003 of another service "Rando moto" (see below). There's a specialty shop called Antibes Engineering on the Cote d'Azur (France's Mediterranean coast), that's been turning out some incredible transformations the last few years. 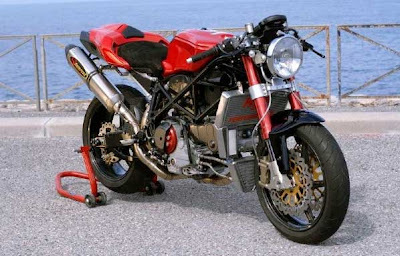 The bike seen above is a Ducati 749 Caligna that was featured in Desmo magazine here a few years ago to rave reviews. Their newest project is a the 1098 Oté'a. Dainese has dedicated a new 289m2 showroom to in Corbeil-Essonnes region outside of Paris mixing their D-Store concept with a factory outlet. Located just off the highway exit that leads to the Orly airport at 8 rue Jacques Anquetil, the location is ideal for locals and travelers alike. This concept is designed to make the universe of Dainese accessible to all fans of the brand is totally original in that it represents the union of a D-Store, the single marque store of the little red devil, with a whole new concept tfor Dainese, that of providing an outlet. In the D-garage, bikers will find a wide selection of clothing from the latest collections, as well as a wide selection of products at factory prices to live out their favorite sport: motorbike, ski or mountain bike all with the maximum safety! The annual JPMS motorcycle industry show just took place her in France and each year the organizers offer awards to new products in a number of categories. One of the winners is a line undergarments by a new company called Skeed. There site is currently the only way to obtain these products, a policy choosen by Skeed to limit the cost of its 100% French (manufacture of fibers, weaving and tailoring) products. 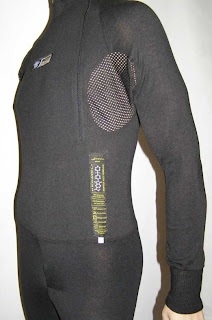 The unique feature of Skeeds undergarments is that in addition to providing thermal protection in case of cool temperatures, they also provide greater safety through the fiber used in the manufacture of these products. The Kermel aramid fibers are intrinsically fire-resistant and non-melting, protecting the rider from road rash burns during a fall. The Ile-de-France will invest 1 million Euro for the renovation and improvement of the Circuit Carole towards increasing it's safety. Jean-Paul Huchon, president of the region IDF has undertaken this project along with the French Federation of Angry Motorcyclists (FFMC). 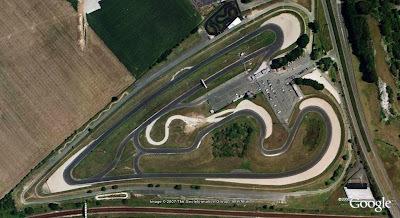 This decision came to pass even as the issue of closure or relocation of the circuit has been ongoing for several years, and as Huchon announced earlier this month, his opposition to the principle of a circuit that could host major motorsports events in the Ile de France. The Circuit Carole is a race course expressly designed and used for local motorcycle events. LS2 is a brand new helmet brand with headquarters located in Spain. The marque, looking to expand into the already clogged European market is trying to distinguish itself from the usual offerings. 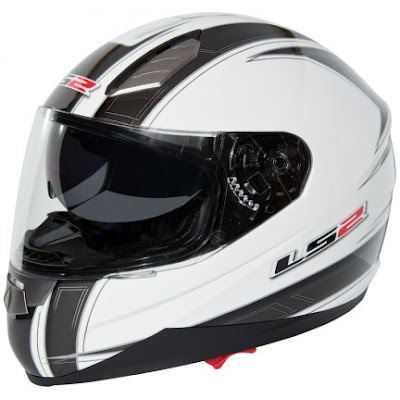 LS2 offers helmets with dynamic lines and a very aggressive profile. To keep their price low, the helmet employs, no fiberglass but instead makes use of a shell constructed of injected PC/ABS. But it does include such nice features as a retractable sunscreen providing a noticeable improvement in terms of ride comfort. The interior is also removable and washable. The chin strap closure features a micro-adjustable clasp. The principle seems interest with prices starting from 119 € for solid colors and 139 € for graphics. And if the quality is at least as comparable to the large manufacturers with much more sober offerings, LS2 could turn out to be a real hit. Available from XS to XXL in 12 versions. 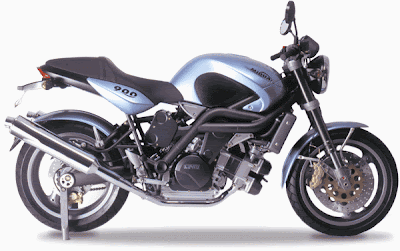 French Motocycles: The Return of Midual? An amazing piece of news was recently let loose on the site of the region, Pays de la Loire. Last December, Jacques Auxiette (President of the Regional Council), Jean-Claude Antonini (Angers Mayor) and Bruno Heuclin (Regional Director of OSEO) met Olivier Midy, one of the creators of one of the last great French motorcycle projects: the 900 Midual. The project was launched in 1992, the prototype presented in 1999 and since then...radio silence! If you own a Harley-Davidson XR 1200 and you're a fan of the legendary 1000 XLCR (the cafe racer produced in small series by the MoCo in the late 70s), Jewel Racer out of Toulouse, France offers to combine your two passions with this very well done replacement body kit. It includes a fairing, full gas tank cover, a tail-piece with snap mounted saddle (just like on the original and brushed aluminum finish handlebars. The fiberglass components are delivered ready to paint in black gel-coat finish, but if you are going for the vintage look, who'd want to change it. Installation takes some ten minutes, each element mounting in the same fashion as the original pieces. 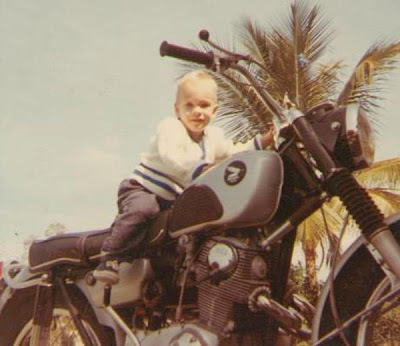 In just about "the blink of an eye" you can go from street tracker to vintage cafe racer depending on your mood. Of course, all this comes at a price (1 345 € HT, each element can be purchased separately also). Looking for something a bit different in an open face helmet than the usual offerings? 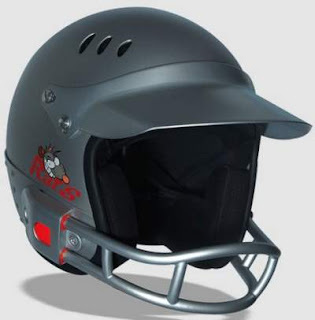 French manufacturer Roof is launching the new Rats lid, with design inspiration taken directly from american football equipment. Homologated for European standards (CE E22-O5 J), the Roof Rats impress more through its unique look than by its technical prowess. It's a basic fiberglass shell helmet than does get at least get points for it fully removable and washable lining. Vents are also placed front and rear for a bit more ventilation but can not be closed. Then again, if you are sporting a open face lid, you're not looking for wind protection!